Minty Elderflower scented body butter in a plastic tub featuring the enchanting Folklore Rabbit. Packaged in a one-piece gift box with matching design. 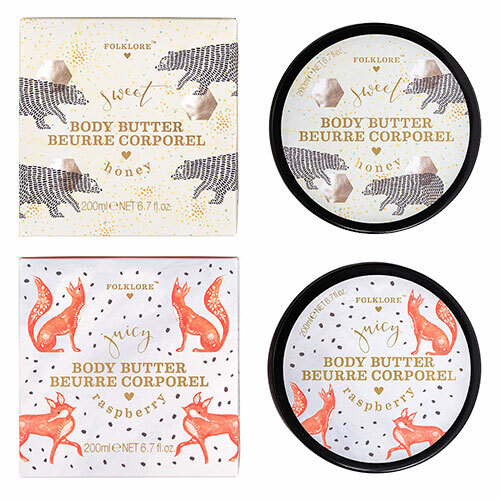 Juicy Raspberry scented body butter in a plastic tub featuring the whimsical Folklore Fox. Packaged in a one-piece gift box with matching design. Sweet Honey scented body butter in a plastic tub featuring the brave Folklore Bear. Packaged in a one-piece gift box with matching design.